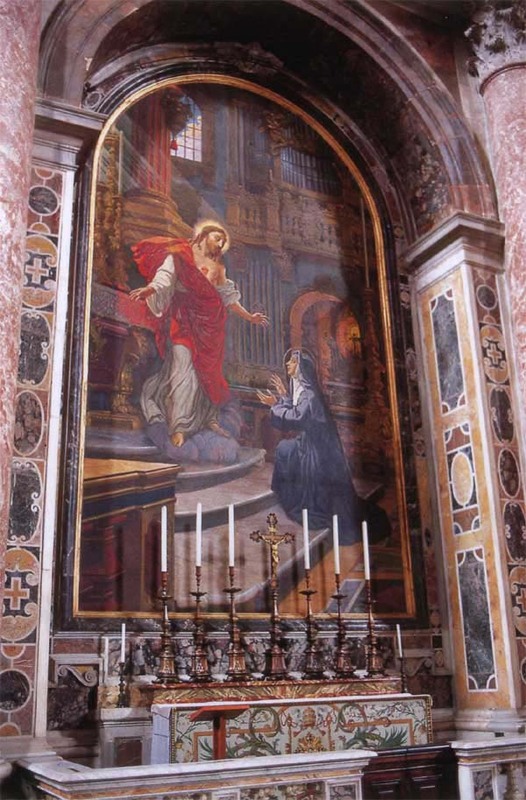 The mosaic altarpiece is of a vision of the Sacred Heart of Jesus to St Margaret Mary Alacoque. She was responsible for the spread of this popular devotion to Our Lord's Sacred Heart. 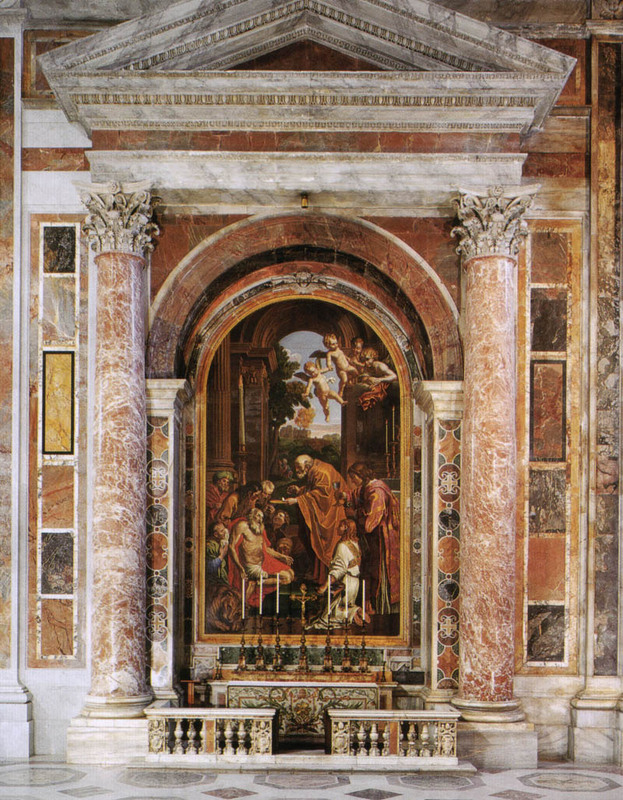 The painting for the mosaic was by Carlo Muccioli in 1919-20, and commissioned to be displayed at the saints canonization in 1920. The mosaic was executed from 1920 to 1925. This altarpiece replaced the "Fall of Simon Magus," painted by Francesco Vanni in 1603. 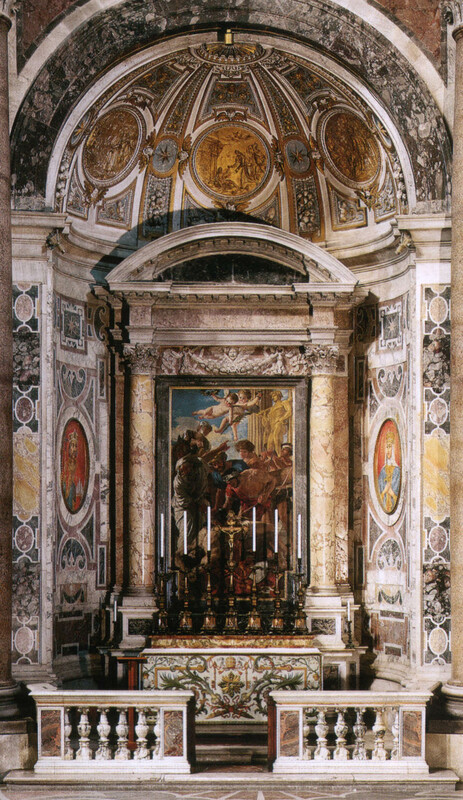 The rededication of the altar was in 1923, at the wish of Pope Benedict XV (1914-1922). 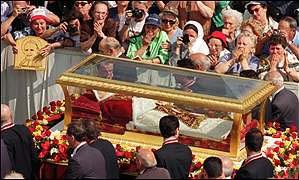 The pope had canonized St. Margaret Mary Alacoque on 13 May 1920, just three days before the canonization of St Joan of Arc. St Margaret-Mary Alacoque (1647-1690) Feastday Oct 16. 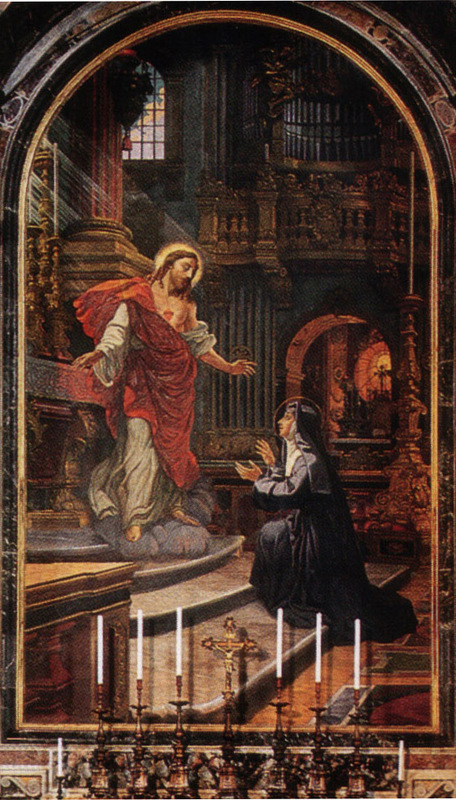 She was from L’Hautecourt in Burgundy, France, became a Visitation nun at Parayle-Monial in 1671 and then had a series of visions of Christ which led her to start work at the spreading of public and liturgical devotion to the Sacred Heart in 1675. This caused violent opposition from her own community and from outside, especially from Jansenist circles. The modern popularity of the devotion to the Sacred Heart derives from her. The saint described the vision of the Sacred Heart as: “The Divine Heart was presented to me in a throne of flames, more resplendent than a sun, transparent as crystal, with this adorable wound." She has a flaming heart as her attribute. 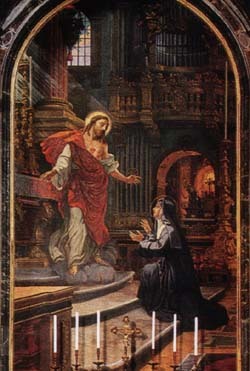 The Carlo Muccioli (1857-1931) painting of the appearance of the Sacred Heart to St. Margaret Mary Alacoque was executed in mosaic from 1920 to 1925 by Ludovico Lucietto, Evandro Monticelli, Carlo Simonetti, Luigi Chiaserotti, Lorenzo Cassio, and Romolo Sellini. In 1955 Muccioli’s picture was sold to the Seminario Serafico dei Minori Cappuccini in Todi (Perugia). 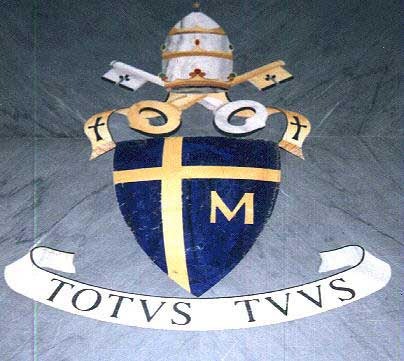 Muccioli was named Director of the Vatican Mosaic Studio from 1922-1931. 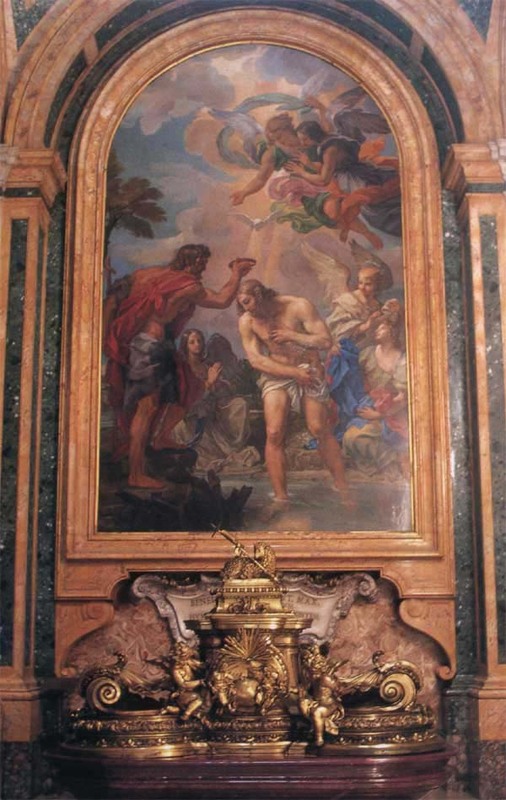 The original altar dedication was to an episode in the life of St Peter, the Fall of Simon Magus. Simon Magus, or Simon the Magician, had a confrontation with St Peter recorded in Acts 8:9–24. Simon offered the apostles money for the ability to command the power of the Holy Spirit. The act of simony, or paying for position in the church, is named after Simon. In apocryphal works, Simon also appears as a sorcerer who levitates to prove himself a god. St Peter prays to God to stop his flying, and Simon falls to the ground and dies. 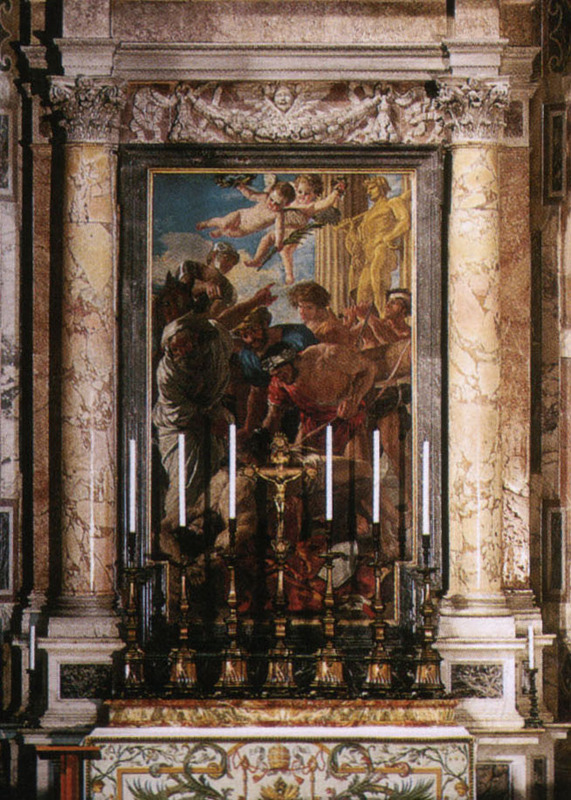 Clement VIII Aldobrandini (1592-1605) provided the original altarpiece, painted by Francesco Vanni from 1602-1603. 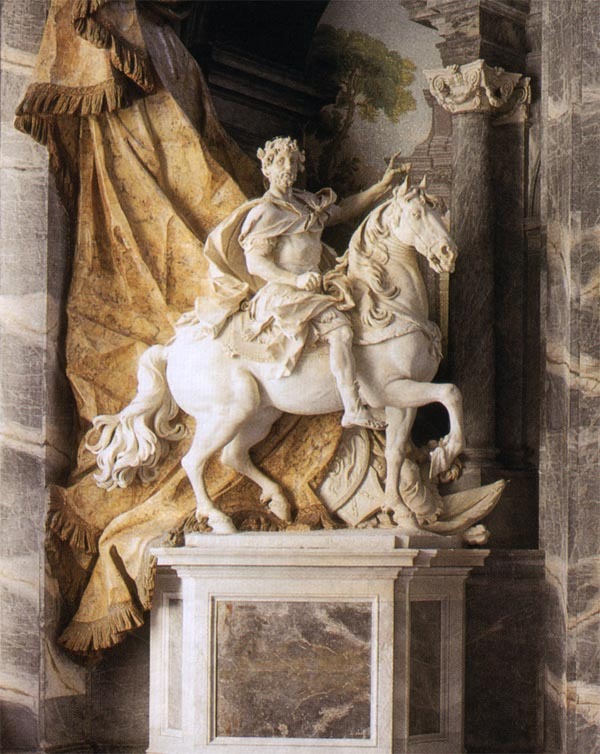 Clement VIII provided altarpieces for six altars during his reign. 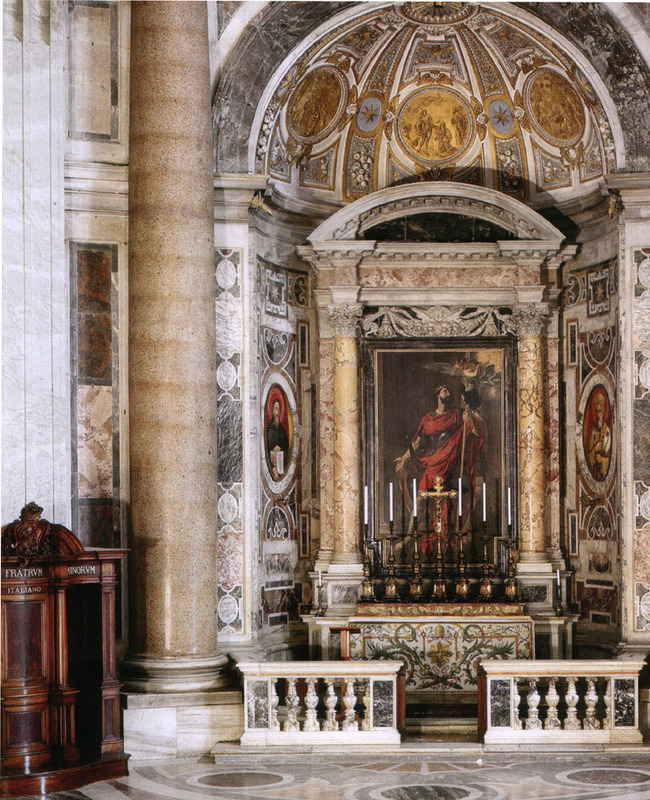 These altars, positioned symmetrically behind the crossing piers, were furnished with commissioned paintings representing scenes from the life of St Peter. They included, clockwise from the southeast corner, the Punishment of Sapphira by Cristofano Roncalli (1599-1604); the Crucifixion of Peter by Domenico Passignano (1602-1605); the Fall of Simon Magus by Francesco Vanni (1602-1603); Peter Healing the Cripple at the Golden Gate by Cigoli (1604-1606); the Raising of Tabitha by Giovanni Baglione (1604-1605); and Christ Summoning Peter to Walk on Water, more often known as the Navicella, by Bernardo Castello (1604-1605). 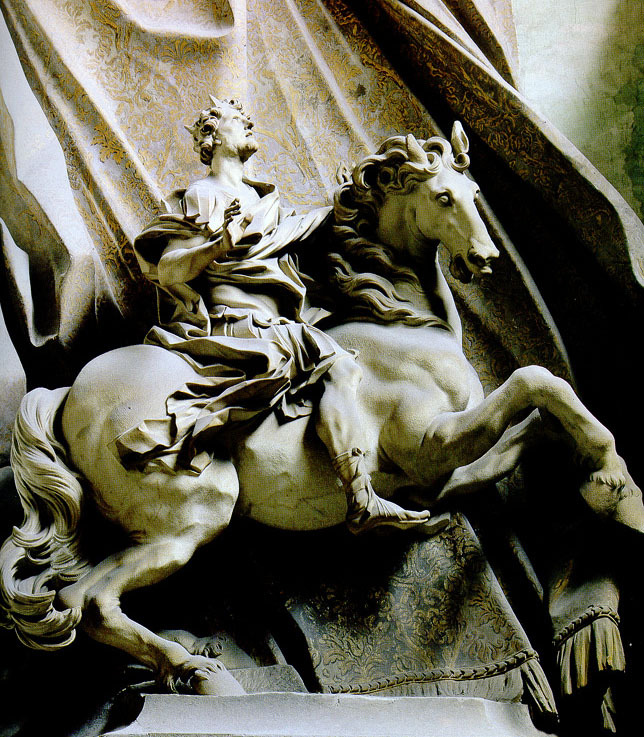 According to Baglione, the distribution of the subjects among the chosen artists was delegated by Clement VIII to Cardinal Cesare Baronio, his confessor and theological adviser. 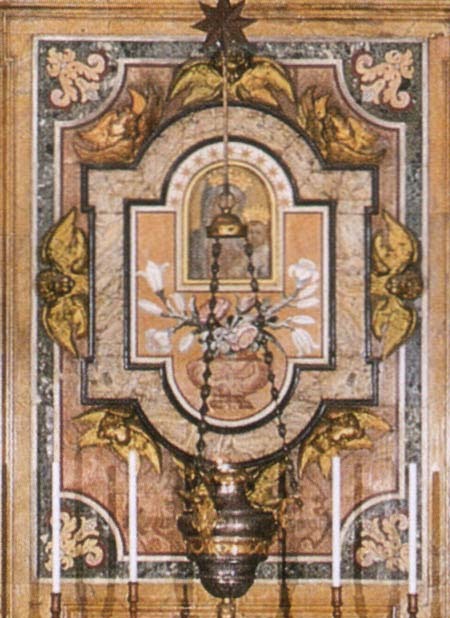 On this basis, Baronio has been identified unquestionably as the iconographer of the cycle. 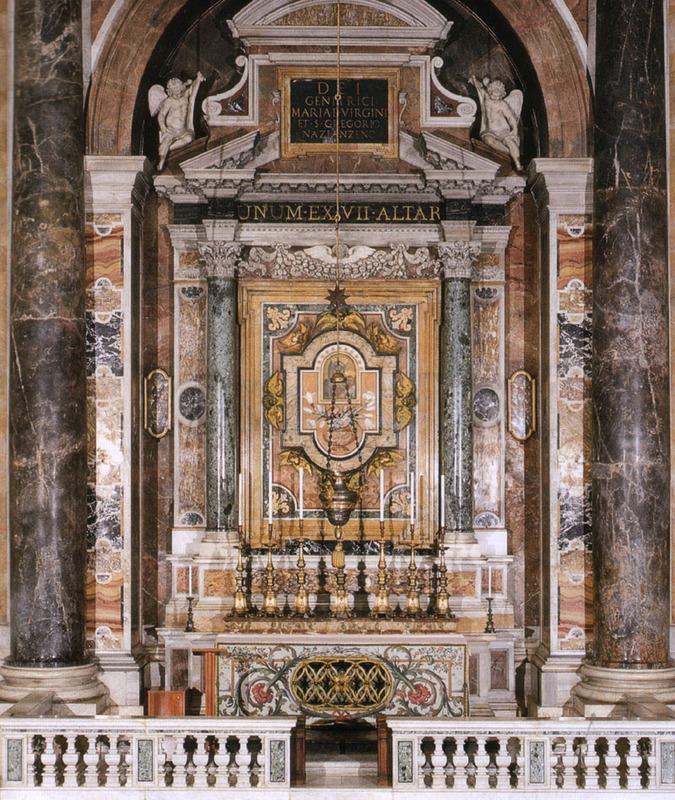 Clearly, Clement VIII conceived of the pictures as forming a ring around Peter’s tomb and the papal high altar, like the setting of a jewel. 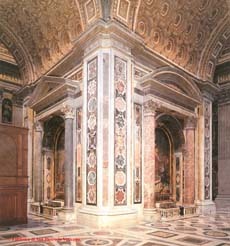 The programmatic treatment of the altars in the navi piccole (small aisles) was entirely unprecedented. In no other church will one find a comparable cycle of altarpieces illustrating scenes from the life of a single saint. Occasionally one will come across series of altarpieces illustrating episodes from the life of Christ or his mother. But in those cases, the episodes chosen are usually feasts in their own right. 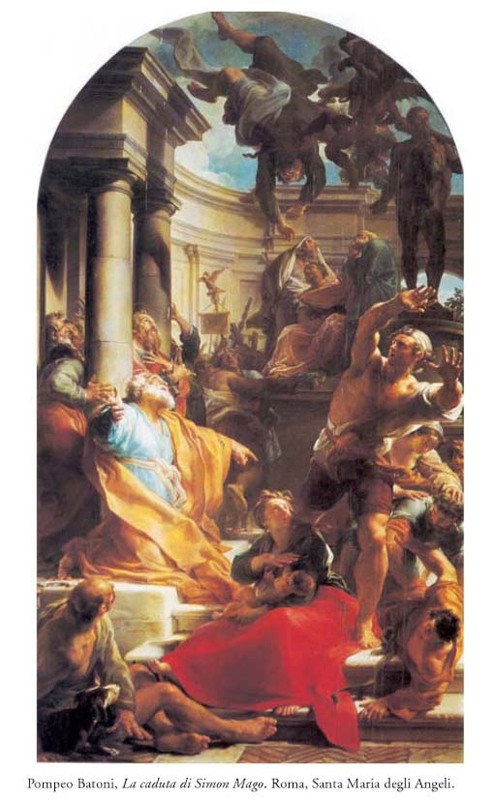 A copy of Vanni’s painting of the Fall of Simon Magus was made by Pierre Charles Tremolieres. This painting, which used oil on canvas, was finished in 1736. 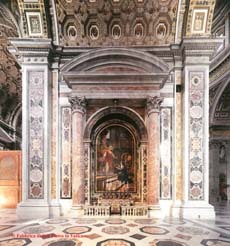 The canvas is currently located in Santa Maria degli Angeli, Rome. 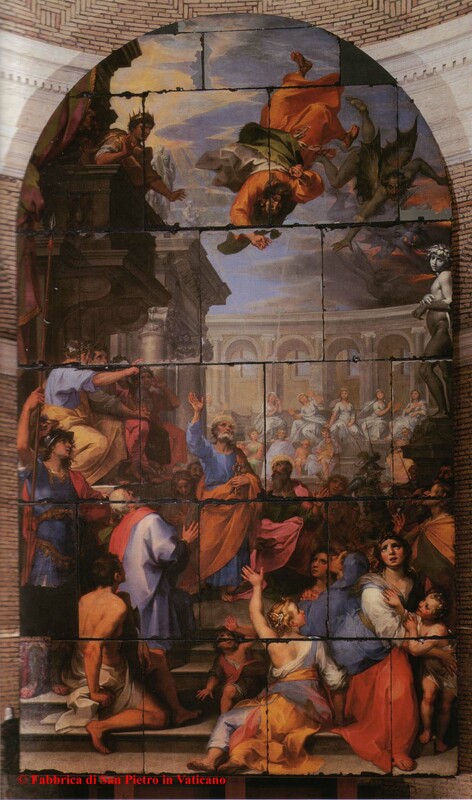 Vanni’s painting, done on slate, underwent a number of restorations. 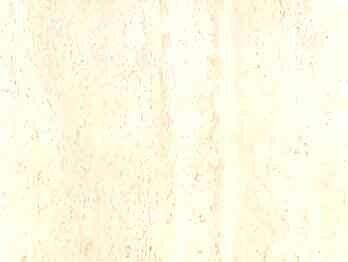 A new picture on the same subject was sought as a replacement. Pompeo Batoni (1708–1787) was commissioned to paint the altarpiece in early 1746. Batoni spent nearly 10 years working on the painting, drawing hundreds of sketches of the complex composition. He received payments from 1746 to 1755. 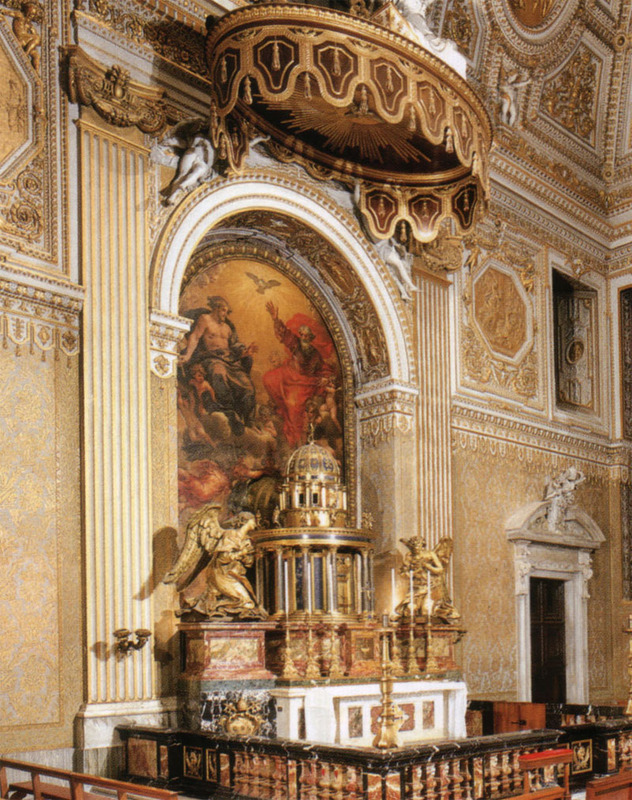 In 1755 Batoni's finished painting was exhibited at this altar in St. Peter´s, and the translation into mosaic started, But in March 1756, after the mosaic work was ongoing for nine months, the Reverenda della Fabbrica decided to end the project. Only one payment was made to the mosaicists Guglielmo Paleat, Giuseppe Ottaviani, Giovanni Francesco Fiani, and Alessandro Cocchi. 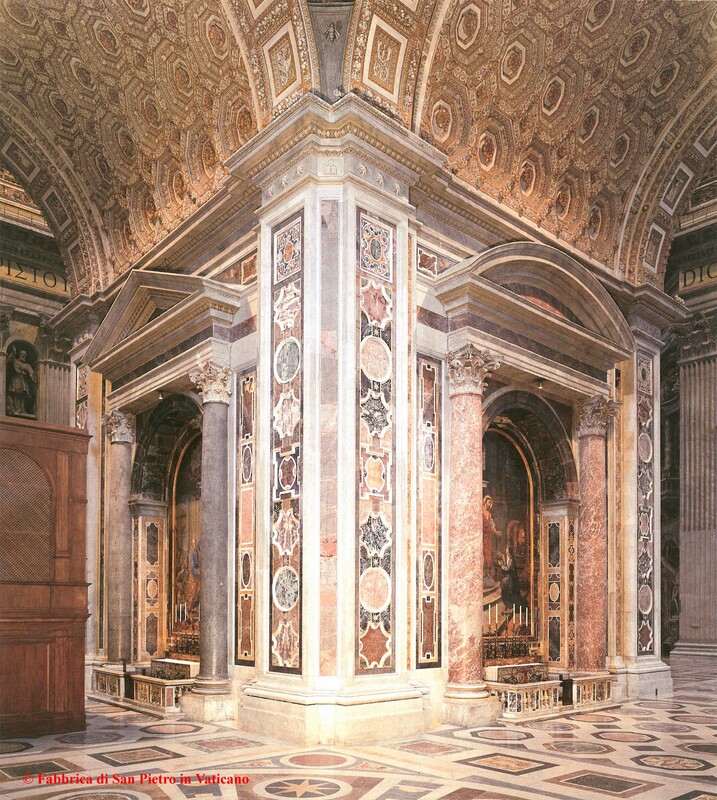 In October 1757 the painting was moved to Santa Maria degli Angeli, where it is still located today. Some sources indicate that style actually was the reason to abandon Batoni´s project. This is because the taste of art in the eighteenth century tended more towards the Classicist style than the Baroque style. Even though Batoni is said to be an early classicist painter, the style of his work about Simon Magus was very dramatic. 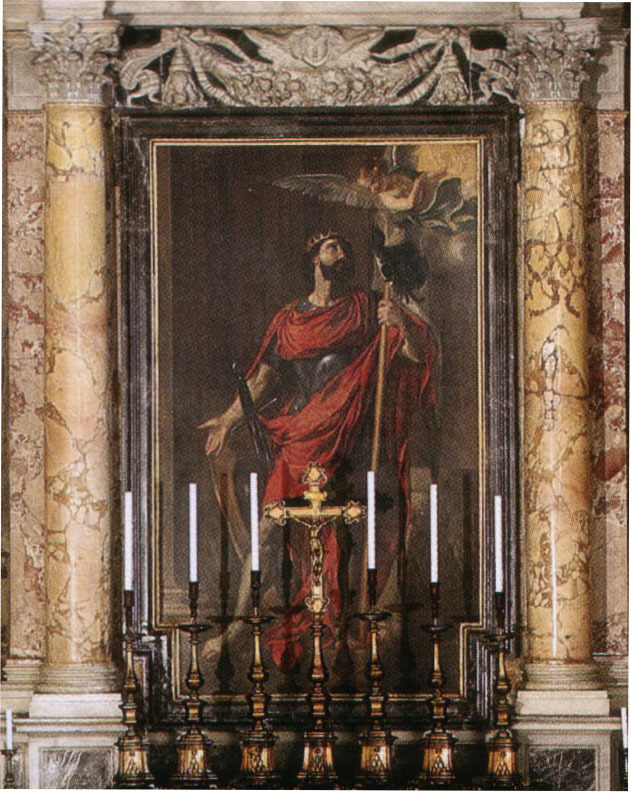 The Vanni painting remained on the altar until the 1920’s, when it was finally replaced by the present mosaic of the Sacred Heart. It's interesting that Pompeo Batoni, who's altarpiece was rejected, also created a famous painting of the Sacred Heart in 1767. 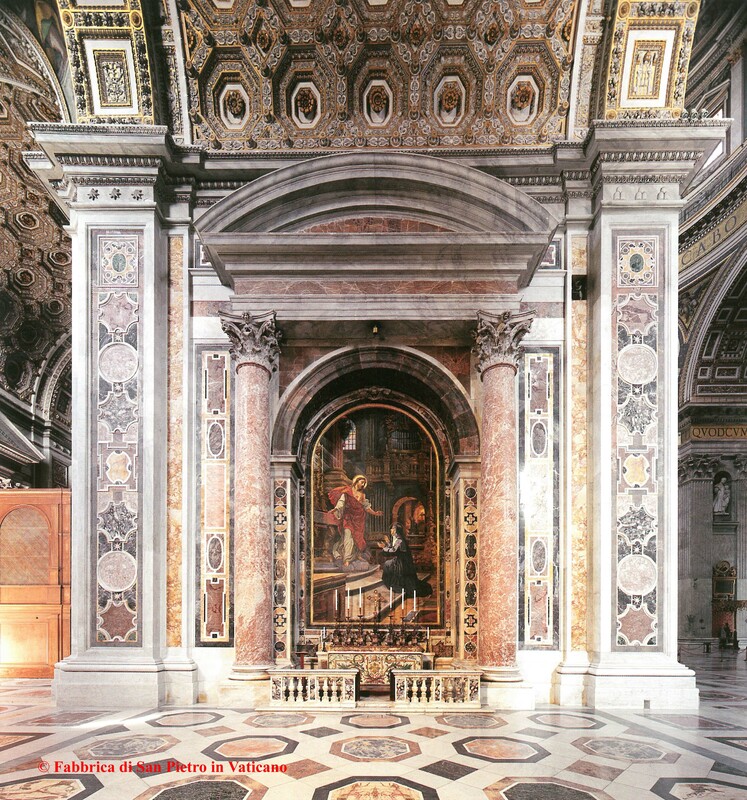 This image is now located in the Church of the Gesu.